I’m happy when I’m knitting. Sure, it’s not all roses when it comes to complicated patterns, dropped stitches, and losing count in the middle of a row, but all in all, knitting brings a smile to my face. Now that we’ve officially entered fall (although that just means it’s 70 degree in Southern California — no, I’m not complaining), my craft fever scale has tipped slightly in favor of knitting over sewing. There’s nothing more joyful than sitting on the couch and knitting a lovely project in a cozy home, while watching some silly television shows — all while the husband helps untangle the ball of yarn for you. This is what happiness is all about. I’m so incredibly blessed. Currently on the knitting needles is this adorable ribbon-edged cardigan from Debbie Bliss’ Special Knits that I’m making for our little Pon Pon. I’m making one for 12-24 months baby so it’ll be a while until she gets to sport this pink cardigan, but I know how quickly the first year flies. I was really looking forward to finishing it this week but it turned out that I didn’t have enough yarn! I actually got these Rowan Amy Butler Belle Organic DK yarns in Hibiscus by accident a few years ago (I was actually trying to buy them in purple to finish this project but got them in a wrong hue), and only had three skeins on hand. I just placed in order so it’ll be a good few days until the Pony Express delivers them to my doorstep and I can resume the project. I think I’ll cast on a new project while I wait for the delivery. I’m so glad that my arm is feeling better now. Updated 12/7/12: I finished knitting the sleeve and the sweater is complete! It is currently being blocked on the dining table. Weaving in ends took forever, but I’m happy with how it came out. It’s time to look for matching buttons. Can’t wait to post the final photos soon. 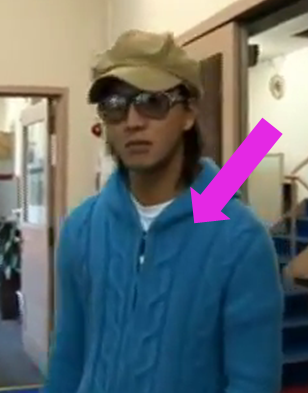 While watching an episode of a Japanese variety show called SMAPxSMAP the other day (I’m so addicted to the segment called Bistro SMAP), I saw one of the hosts and actor/J-pop star Takuya Kimura show up wearing this simple but super cool blue cable hoodie and I said to myself that I MUST have one just like that immediately! But after failing to find something similar online, I decided to go ahead and knit my own. I wasn’t in the mood for something too involved, so I turned to a pattern in a book, The Yarn Girls’ Guide to Beyond the Basics, for a quick and painless knit! I ditched the zipper in front (that would be too much work) and opted for a basic pullover instead. That’s what’s so wonderful about knitting – you can create any piece of garment you desire, as long as you’re willing to spend some time on the craft. My finished piece doesn’t completely resemble Kimutaku’s version, but I’m really happy with how it turned out. This is the first sweater that I knit that I would actually wear. I used Cascade 220 yarns in turquoise for the project. They were on sale for $6.75 (regularly $9) per skein from WEBS Yarns and I only used 6, so the price for this sweater (sans labor, shipping, and taxes) was a mere $40! After all the pieces were complete, I blocked each piece by soaking them in water and pinning them flat on a towel. Wet yarn really makes your place smell like a herd of wet sheep just walked by. Sewing is my least favorite part of the knitting process. I don’t mind the actual sewing but I don’t enjoy threading the yarn through a needle. I knit a hoodie but I decided to omit it because it was becoming a major pain to sew it onto the sweater. I’m actually happy with the decision because I like the slightly formal and womanly feel that it now has. And here is me, sporting my new favorite sweater! Happy holidays, everyone! I hope you enjoy this special time of the year with your friends and family!